Fire is the beginning of cooking. Before you can master grilling you must first master fire. Now those with gas grills will say you don't need to know how to build a fire, but don't dismiss the art of fire making. Knowing how to put together a good cooking fire is not only a skill that might be needed if you end up a contestant on Survivor, it is also something that will make you a better griller, gas or no gas. When it comes to lighting up a charcoal fire many people think you dump in the charcoal, pour on the lighter fluid and throw in the match. After 10 to 15 minutes you can kick the grill to settle the coals and start grilling, right? Well, yeah, you could do it that way. You might end up with burnt burgers and raw chicken, though. One of the keys to good grilling is an even fire. The only variations in heat should be the ones you plan for. 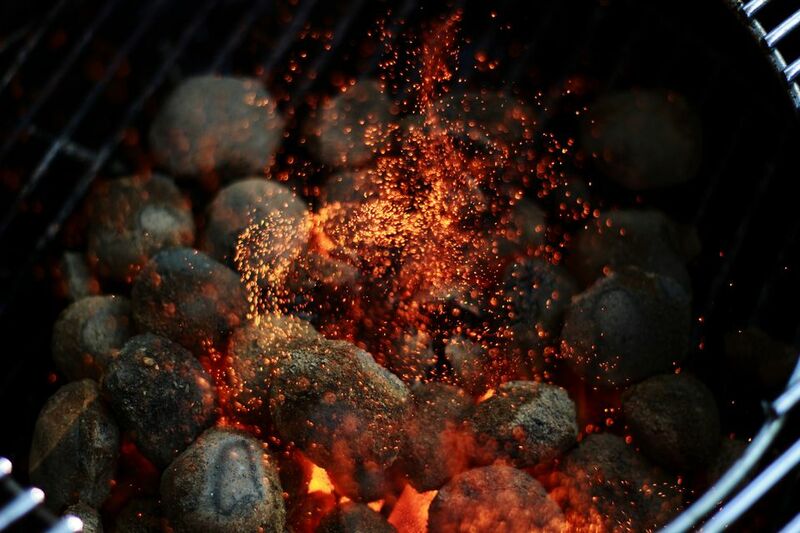 Randomly spreading hot coals in your charcoal grill will make a series of hot and cool spots. Even distribution of coals reduces this variation to a minimum. This is important to get even grilling, especially if you have a large amount of food on the grill. Once you have mastered even heating it's time to step up to the professional level. Chefs like to have controlled temperature variation, meaning a hot area and a not so hot area. In grilling, we call this a two-level fire. If you imagine a dual-burner gas grill, set one burner on high and the other on medium. The advantage of this is that you have an area to sear foods and an area to cook them through. In a charcoal grill, you will want to set up half your fire grate in a single layer of coals and the other half in two or three layers of coals. This will give you the hot and medium areas to do your cooking. This method is also good if you are cooking different types of foods. For instance, if you were grilling up some fajitas, you could sear the steak over the high heat and cook the peppers over the lower heat. Once you have mastered the two-level fire you will definitely see the advantages. Another fire you need to know how to build is the indirect fire. In its simplest form, you can put all the coals on one side of the grill and leave no coals on the other side. In a gas grill, this is the equivalent of turning the burner on one side on and leaving the other off. Of course, you can do much more with this. For instance, the ring of fire is a great strategy if you are using a kettle-style grill. Once you have hot coals, push them to the outside of the coal grate leaving the middle empty. This will give you good even heat all around and a good indirect cooking space. When it comes to building an indirect fire one of the most frequent problems is having the fire on just one side of the grill. With gas grills, there isn't much you can do about this. The problem is that the heat is uneven. One side of the food you are cooking will get more heat than the other, forcing you to turn frequently to keep it even. With a charcoal grill, you can build the fire everywhere but under the food you are cooking; this gives a more even heat. The last thing to consider when building a fire is hardwood. If you want to add wood chips to your fire it's best to have a place to do that. With gas grills, you need to use a firebox or wrap the moistened wood chips in foil. With a charcoal fire, you can leave a small area with very few or no coals. This is a good place to put wood chips; they will smoke but not burn away quickly. So when building a charcoal fire, leave a little room for some slow-burning wood chips to add some smoky flavor. How do I grill indirectly on a charcoal grill? Ever Wondered Why the Flame in a Gas Grill Burns Yellow?